Pilgrim Scribblings: What a Rush! Last Saturday the boys and I attended the Air Show at the Canadian National Exhibition in Toronto. The U. S. Navy's Blue Angels acrobatic team were the star of the show and it was thrilling to watch them do their magic over the waterfront by Ontario Place. 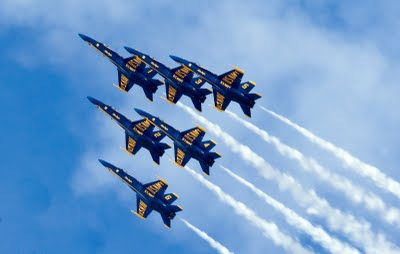 The sound of six (6) F-18's flying in formation at low altitude gave me a "rush" that's hard to explain. I've always loved airplanes and I've always enjoyed watching planes landing and taking off at airports. I'm also a NASCAR fan and often the beginning of a race is announced with a fighter jet flying overhead just as the drivers are told to start their engines. The Air Show was exceptional at the CNE and we were glad we made the effort to be there!